Heel Height: Approx. 1'' Tall. Enjoy the comfort of classic Mary Jane style in the Propet Mary Jo Walker. 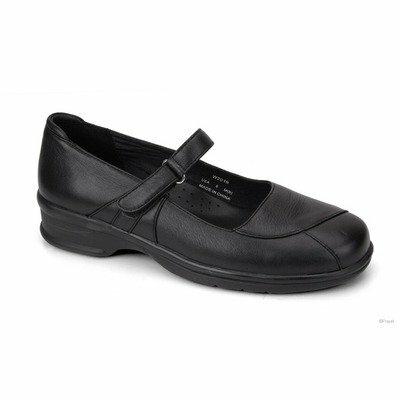 This womens shoe is set in a supple soft grain leather upper with a leather or nylon lining for extra comfort. The extended heel counter and stabilizer provides all day support, as does the built in durable arch support. The adjustable instep strap defines this Propet Mary Jane womens shoe and allows for better fitting. The removable Poliyou insole with leather sock accommodates custom orthotics and the dual density Polyurethane unit sole provides shock absorption and traction. Embrace comfort and feminine style in the Propet Mary Jo Walker.